8/02/06- Last weekend July 21-23rd was the 145th Bull Run, some pictures from the event, taken by the Mayer Family are available in the 2006 Event Photos Section. The Equipment List for our group is now available in the Download Page. 2/13/06- The 2006 season is right around the corner. We have a busy, well balanced schedule planned. The 06 Schedule is up in the Event List, and available in the new Download section. 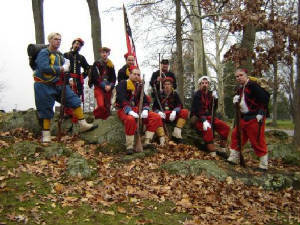 12/14/05- The 2005 reenacting season has come to an end, we didn't do much as a group, but we did have some great moments, and that's whats it's all about. 2006 will be our first real season, and I know it will be a great one, as we continue to build towards our goal for the 145th 1864-65 Events in a few years. 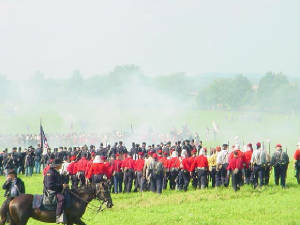 11/20/04- On Remembrance Day this year reenactors, decendents & civil war buffs flocked to Gettysburg to once again pay homage to the deeds of our forefathers. A big thanks to Lt. Shaun Grenan & Co. A of the 114th PA, a great day that will not be forgotten. The day was capped off in the National Cemetery at Gettysburg, the final resting place of George Wilcox & William Douglass of the 155th. Aaron Hooks & descendant Tommy Hammerbeck met on LRT at the Monument to give thanks.